Dr. McLaughlin's Preso: "From Discovery to Clinical Trials"
In order to understand how paw paw works, it is helpful to be familiar with a little biology on human cells. It is also recommended that you watch the video animation on paw paw if you have not already done so. It may take a couple of times watching it to catch everything, but it should help your comprehension of the material. Simply put, cells need energy to live, survive, and multiply--no real surprise. After all, we know that we must give our bodies energy in the form of food in order to live. During the digestion process, the food begins to be broken down and put into a form that eventually can be utilized by the cells in our body. One result of this process is the formation of blood sugar, or glucose. As blood travels throughout the body, the cells absorb the life-sustaining glucose. All cells need it, but some need more than others and are thus "high-users." The cell has some special molecules on its exterior that transport glucose from the blood into the cell--appropriately called "glucose transporters." However, at this point, the process is not done. The cell must then convert the glucose into usable electrons--in other words, usable energy. There are a couple of different processes that the cells use to accomplish this, but the vast majority of the metabolism (energy conversion) that takes place is through the mitochondria of the cell. The mitochondria resides on the interior of each cell. Actually, each cell has hundreds or thousands of them. 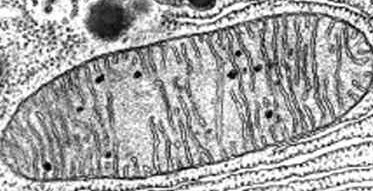 (On the picture, the mitochondria are the "sausage-shaped" structures on the interior of the cell walls.) As noted earlier, their primary purpose is to take glucose and oxygen and use it to produce the energy that the cell needs. The energy that is produced is called adenosine tryphosphate, or ATP for short. In general, cancer cells fit the profile of "high users" of ATP. In fact, some studies indicate that they need anywhere from 10-17 times as much ATP as a normal cell in order to survive and multiply. Thus, if the ATP that is produced by the mitochondria of the cancer cells can be somehow controlled or reduced significantly, those cells can be negatively impacted, hopefully making them die off. Research by Dr. Jerry McLaughlin of Purdue University found that the paw paw tree is a source of substances known as acetogenins. (Since the family Latin/scientific name of paw paw is Annonacea, these natural substances are often referred to in the literature as Annonaceous Acetogenins.) It is these acetogenins that he found to drastically reduce the ATP production of the cells' mitochondria. There are several different acetogenins. They vary from species to species of trees within the "paw paw family", and within other related trees. However, Dr. McLaughlin found that the highest concentrations and most powerful acetogenins were in the Asimina triloba species of the paw paw. Furthermore, he found that there were even differences in the actual geographical location of the trees--noting during his research that some groves of trees were more potent than others. Important Note: Not surprisingly, some companies have produced products using graviola (a biological cousin of the paw paw) and market them as similar to--or equal to--paw paw itself. However, Dr. McLaughlin showed this to be false. He has written on several occasions in technical papers detailing the big difference chemically and structurally between the acetogenins found in graviola and those found in paw paw. Dr. McLaughlin developed a procedure to standardize extracts from paw paw to contain a certain known amount of acetogenins, and licensed it to a company in Utah. Thus, it is important for anyone contemplating using the paw paw treatment to be sure that a standardized extract of from the Asimina triloba tree is obtained--not graviola, since graviola is far less potent due to its chemical structure. Read about differences between paw paw and graviola. Further research by Dr. McLaughlin found that although the acetogenins are found throughout the paw paw tree, fruit and seeds, the greatest concentration of them is in the twigs of the tree. Also, he found that the acetogenin levels peak during the month of May. Thus, even the time that the paw paw is harvested is drastically important. Thus, someone using the paw paw treatment needs to verify that the manufacturer harvests the twigs at the right time of the year. When a person intakes a source of acetogenins, such as a capsule of standardized paw paw extract, the blood supply picks them up and delivers them throughout the body along with glucose. Although a slight amount of acetogenins may wind up in non-cancer cells, the resulting lowering of ATP production is not enough in most of these cells to cause any problems. The huge energy requirement of the cancerous cells tends to "hog" most of the acetogenins to those cells. Furthermore, when the acetogenins start working on the "high-usage" cancer cells, the resulting drop in ATP energy production is much greater than it would be in most normal cells. Thus, if cancer cells are present in the body, the paw paw tends to affect them, while leaving the normal cells alone. Unlike chemotherapy, the paw paw works to "starve" the cancer cells instead of poisoning them. Thus, the action is usually slower than chemotherapy. However, the side effects are minimal, as discussed below. Acetogenins modulate/reduce the production of cellular energy (ATP), thus robbing the cancer cells of the energy it needs to survive. This is the basic process described above, and certainly one of the most important. Acetogenins help modulate/reduce the growth of blood vessels near the cancerous cells. Since the cancer cells need more ATP, they need more glucose to convert into it. Thus, the body tends to grow new blood vessels to deliver the glucose. Actually, the new blood vessel growth needs ATP itself, so the ATP reduction helps reduce that growth that is necessary for cancer cell survival. Acetogenins enhance the effectiveness of chemical medical treatments. It is very common to hear that cancer patients undergoing chemotherapy develop a resistance to the chemo itself, thus rendering the treatment to no effect. This is usually called Multiple-Drug Resistance (MDR). This resistance takes place because cancer cells will develop the ability to recognize and reject chemicals that it becomes familiar with. The cells will actually develop a "pumping action" to pump the chemicals back out of the cells before the chemicals have their desired effect. However, this pumping action used to reject the chemicals uses--guess what--ATP. Lowering ATP to these cells reduces their ability to pump out the chemotherapy drugs, thus making the cells susceptible to the chemotherapy treatments again. Several technical articles have been written on the effect of paw paw on MDR cells, some of which can be read on this website. Acetogenins help reduce duplication of cancer cells. The DNA and RNA are "blueprints" that affect the structure and behavior of cells. However, ATP is an essential part of DNA and RNA division and reproduction. The lowered levels of ATP tend to reduce rapid cell growth. If a person is serious about this type of treatment, only a standardized paw paw extract should be used. It is definitely best to purchase the product from a manufacturer that Dr. McLaughlin has personally worked with. Normally, a capsule is taken 3-4 times daily with some food. If swallowing is an issue, the capsules can break apart and the contents mixed into something easier to swallow. While not necessary for the action of paw paw to work, many people often use paw paw in conjunction with a beta-glucans, immune stimulating type of product. The beta-glucans are usually taken in between the times when paw paw is taken (between meals). Side effects. Another positive thing about paw paw is the lack of side effects. At least one paper noted that paw paw was 300 times as toxic as one leading chemotherapy drug--without the side effects of hair loss and weight loss normally experienced. If the paw paw is taken on an empty stomach, the recipient might experience nausea and/or vomiting. The same is true if a person were to try to overdose on paw paw. (This natural anti-overdose mechanism is yet another positive.) On very rare occasions, a recipient might feel a temporary lowering of energy due to ATP reduction in cells throughout the body. Other than these, there are no side effects known. Typical Duration of Use. In general, paw paw should not be used for any sustained, prolonged time unless abnormal cells are present. In the absence of cancer cells, the paw paw will be attracted to other cells in the body that are "high energy usage" cells. They could be anywhere, but the likely candidates are in the digestive and intestinal systems. Because of that, paw paw should not be used as a preventative. It is sometimes used for short durations (less than one month) internally for parasites. Thus, if a person is determined to be cancer-free, they should generally stop taking it no more than a month later. Often, the person may come back and take it for short durations (about a week) each month. However, sustained, prolonged usage is usually ended. If a preventative is being considered, it is probably wiser to consider things that build and support the immune system, such as a beta-glucans product and a high antioxidant product. There are several good liquid antioxidants available, one of which is mangosteen juice. If you choose to go that route, consider a mangosteen juice that is high in xanthones and without any harmful preservatives. It is these same basic mechanisms that made paw paw effective against lice, parasites, and plant pests. For more information and technical writing, we recommend that you visit our articles section. ©Copyright, 2014. Under no conditions may the contents of this site be copied without express written consent of the owners of this website.